Had he lived, Jimi Hendrix would’ve turned 70 this week. But Hendrix, of course, did not live — he ’scused himself to kiss the sky 42 years ago this past September. This means that Hendrix’s posthumous career has now lasted 150 percent longer than his actual existence on this planet. It’s a mighty tall order for a dead man to maintain the level of productivity required to keep a career that’s now spanned six decades going. But the archival Hendrix releases keep coming: On March 5, a “new” album called People, Hell, and Angels will be released. It features recordings Hendrix laid down in 1968 and ’69 with a revolving cast of backing musicians. 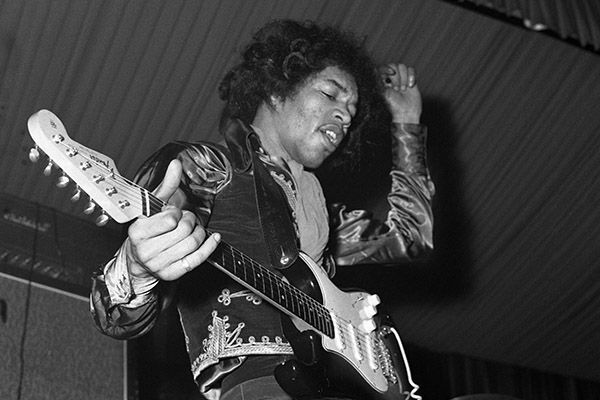 According to Hendrix’s engineer Eddie Kramer, the album title comes from Hendrix himself and was intended for the follow-up to his last official studio album, 1968’s Electric Ladyland. Whether this was an actual album title or merely a list of the most common things that flashed through Hendrix’s brain on a daily basis, we’ll never know for certain. In a new video posted to promote the record, Kramer plays part of the album’s new single — because Jimi was prescient about the need to compete with a new Rihanna record in 2012 — called “Somewhere,” which features backing from Stephen Stills on bass and future Band of Gypsys drummer Buddy Miles. It sounds pretty great, though it’s not exactly new, appearing in different forms on previous archival releases going back to 1975’s Crash Landing. So you’ve been warned, Jimi Hendrix fans: People, Hell, and Angels will be more of the same, except different. Still, it will be cool to hear “Somewhere” live once the Jimi Hendrix hologram finally goes on tour.